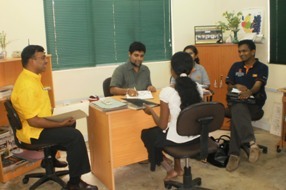 Seenigama BPO provides services to leading Sri Lankan organizations in the Tourism Sector. We commenced in 2010 with a batch of six data processing operators, and expanded to fifteen operators during the course of 2011. We are geared towards expanding our services in the future. Seenigama, a quaint village in the southern coast of Sri Lanka, was one of the worst affected communities during the 2004 Tsunami. One significant outcome of the post-disaster assistance programs in Seenigama was the setting up of Seenigama BPO Technologies, an innovative BPO operation to leverage the local talent. The project was initiated by the Information and Communication Technology Agency of Sri Lanka (ICTA) and implemented by the Foundation for Advancing Rural Opportunity (FARO). We are supported by John Keells Holdings with the funding for infrastructure and training coming from an ICTA replication grant for rural capacity building. Seenigama BPO Technologies is the second BPO operation to be established under the auspices of FARO. We are located in the premises of “The Foundation for Goodness” a well-established community organization that provides career opportunities to the economically disfranchised youth of the area.